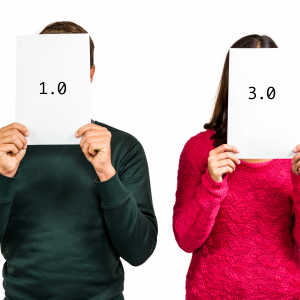 Approximately every nine months, the amount of published research on Flipped Learning doubles. That’s an enormous amount of literature being produced on this amazing pedagogical meta-strategy. Yet, much of it is flawed. It’s not flawed in its methodology or experimental design. It’s not flawed in its interpretation of results. Instead, Flipped Learning as a discipline is at risk of being fundamentally flawed due to the chronic practice of instructors working alone and isolated, as though each were in a silo. Take for example a study looking at the effects of Flipped Learning on fourth-grade math instruction (D’Datto & Miller, 2016), another looking at English-as-a-foreign-language instruction to Korean students (Lee & Wallace, 2018), or a third studying the effects of Flipped Learning college business students (Sherrow & Lang, 2016). Each of these high-quality studies, as strong as they are individually, represent a lack of collaboration among practitioners of Flipped Learning 1.0 (FL 1.0). They looked at a superficiality of Flipped Learning (i.e., watch videos at home and practice work done in class), and the instructors were typically working alone in relative obscurity instead of working collaboratively with other Flipped Learning educators. Siloing and FL 1.0 are behind the curve. It’s time to move on to FL 3.0 and embrace global standards, where widespread collaboration is an essential component of flipped education. In the late 1990s and into the early 2000s, basic research in the life sciences went through a silent revolution. After centuries of individual labs at individual universities working alone and being cut off from the advancements of others, collaboration evolved to become the norm. It was realized that progress was slow because one lab had to wait for another to publish its results, and this slowed the overall advancement of science as a field. The path towards greatness lay in working together in real time. When labs planned projects together, designed experiments together, shared results with one another, and interpreted findings together, the synergy of those accomplishments far surpassed what was possible before. 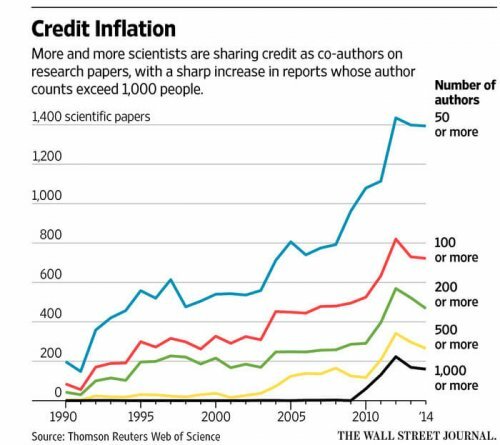 As the graph below shows, the number of authors on publications has skyrocketed since the 1990s, indicative of the extensive collaborations that now occur in the sciences. What led to this silent revolution? Did scientists prefer working in obscurity for centuries until 1990? Of course not. In order for this type of collaboration to be effective, there had to be connections among labs and researchers of similar disciplines. Collaborative groups needed to form by field, not by region or convenience. For this silent revolution to be possible, instantaneous worldwide communication and sharing had to be possible. This movement towards global collaboration had to wait for the Internet to be born. The Internet has been around for a long, long time now, yet Flipped Learning continues to remain in silos. Global collaboration is not only possible, it is facilitated by incredible collaboration tools such as Google Docs, Sheets, and Drive, Dropbox and Slack, to name only a few. Flipped Learning also has something that the life sciences community lacked: a central social platform for connecting and discussion: the Flipped Learning Global Initiative (FLGI; http://flglobal.org/ ). One of the central tenants of the Flipped Learning Global Standards currently being developed at FLGI is global collaboration. Already, nineteen educational institutions (both K-12 and higher ed) have signed on to adopt standards in Flipped Learning training and practice that emphasize global collaboration. These “first adopters” include high schools, middle schools, primary schools, colleges and universities in the UK, Spain, Australia, New Zealand, Taiwan, Portugal, Turkey, and the United States. These truly are the seeds of global collaboration. It is time for the practice of Flipped Learning to meet the curve and surpass it. It is time for Flipped Learning practitioners to collaborate globally. Doing so will advance the reach and evolution of Flipped Learning to heights that now might not even seem possible. These are not pipe dreams. It took centuries for the structure of DNA to be discovered. Then, one of the scientists who was responsible for that discovery, James Watson, lived to see the entire human genome completely sequenced. That is the exponential speed that global collaboration makes possible. That is the exponential speed of evolution that is possible for Flipped Learning. We invite you to join the discussions at FLGI (http://flglobal.org/). Come and collaborate globally! Add your voice to this no-longer-silent revolution in education. D’Addato, T., & Miller, L. R. (2016). An inquiry into flipped learning in fourth grade math instruction. The Canadian Journal of Action Research, 17(2), 33-55. Lee, G., & Wallace, A. (2018). Flipped learning in the English as a foreign language classroom: Outcomes and perceptions. TESOL Quarterly, 52(1), 62-84. Sherrow, T., Lang, B., & Corbett, R. (2016). The Flipped Class: Experience in a University Business Communication Course. Business and Professional Communication Quarterly, 79(2), 207-216. Great article, Tom. The silo is a big problem in music. Many K-6 schools have only one music teacher and in secondary and tertiary, as is the case at my school, we’re often the only one teaching our subject. It makes it hard to find someone with whom to collaborate. I’m reaching out to some teachers in other schools and countries now, trying to establish a long distance connection between flipped classes. Thanks for the comment, George. Siloing is definitely a problem in education, across both grades and disciplines. It really is time for us to all begin leveraging the power of the web to network and collaborate globally. Glad you put a spotlight on this Tom. It isn’t only FL that produces so much research and yet so much of what happens in educational research, in general, stays embalmed in journals and databases waiting for a friendly search engine to break them out. There is just so much “research” out there representing various levels of usefulness, some great, others not so great. A fwell-curated focal point such as this magazine can help people interested in flipped learning engage in networking and sharing, and become a go-to place for up-to-date research and global thinking about FL. Thank you, Barry. I couldn’t agree more!